I wish I didn't have to do it, but it's time - once again - to stick up for economic science. Krugman has crossed the line (I know it when I see it) here. If it offends you that he offends me, then stop reading. You're not allowed to whine about Krugman-bashing. The guy deserves it, after all. ...my sense is that a lot of younger economists are aware, even if they don’t dare say so, that freshwater macro has been a great embarrassment these past four years, and that liquidity-trap Keynesianism has done very well. This will affect future research; it will, over time, break the stranglehold of decadent Lucasian doctrine on the journals. How would Krugman have a "sense" for what younger economists are thinking? He has little interaction with them. He does not go to conferences with them; he doesn't read their papers; he spends little time at Princeton. Mostly, he lives in Manhattan and writes a blog. The finger is far from the pulse, I'm afraid. What is "liquidity-trap Keynesianism?" In case you have not figured that out, it's Hicksian IS/LM. That's been "successful?" How could it be? It's not structural. What is "decadent Lucasian doctrine," and why the heck is it so decadent? Good questions. You'll have to grill Krugman on that. As far as I can tell, we are all "Lucasians" now, and that includes Krugman, who uses many "Lucasian" principles. Complaining about Lucas is something like complaining about the other Bob - Bob Dylan. The revolution happened long ago, and now everyone loves Bob and his influences are everywhere. Krugman might like it if the Bob "stranglehold" somehow let go of the profession. Too bad, Krugman, that's not happening. And the giggles and whispers thing — in which anything resembling non-microfounded Keynesian analysis was the subject of automatic ridicule — is already, I think, over. Look at Delong/Summers on fiscal policy: the analytical core is, yes, the IS-LM model. I don't think this is about giggles and whispers any more. We're all guffawing out loud, I'm afraid. 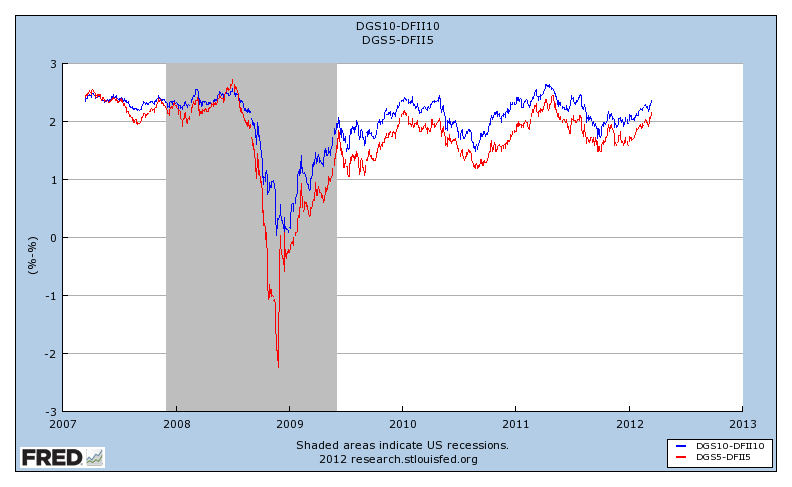 I looked at the the DeLong/Summers paper, and you really should not waste time on that piece of trash. The analytical core is, yes, an IS-LM model. Yikes. Again, there are many reasons why we don't want to go there any more, including the ones I articulated here, and here. In the better world I'm thinking about, we would not have to put up with arrogant loud-mouths like Paul, Brad, and their "fellow-travelers." The world these people envision is one where lazy macroeconomics has free-rein. We would forget everything we have learned in the last 40 years or so. Better still, we could set the way-back machine to 1937. Why fuss with all those bothersome details? IS-LM is so easy - and so right. If you believe that, I have a bridge to sell you. Now would be as a good a time as any to take stock of current monetary policy, commitments by the FOMC, whether existing policy commitments make sense given our recent inflation experience, and what we might expect for the future. At this week's FOMC meeting, policy remained essentially unchanged. Recall that, at the January FOMC meeting, the Committee essentially committed to holding the policy rate - the key rate is the interest rate on reserves - at 0.25% through late 2014, at least. Jeff Lacker dissented again on this round, as he did at the January meeting. Further, my guess is that the FOMC thinks that, even if we start to see inflation rates that are somewhat alarming, it that it can control this inflation through the use of "reserve-draining" tools - term deposits and reverse repurchase agreements. The FOMC thinks it can have its cake and eat it too - without selling assets or going back on its "extended period" language. As well, the inflation forecasts the FOMC gave us here are very optimistic - PCE inflation rates of 1.4% to 2% going out to 2014. 1. Don't worry about the possibility of more inflation coming from oil price increases, or other commodity price inflation. That's only temporary. Just like last year. 2. We believe in the Phillips curve. Not to worry. Plenty of excess capacity out there. 3. FOMC forecasts tell us that inflation is going to remain well below the inflation target of 2%. Trust the FOMC. 4. Even if inflation starts looking pretty bad, the Fed can control it, without raising the policy rate. Well, if I were Ben Bernanke, I would now be seriously worried. But I'm not Ben Bernanke, and I can buy TIPS, so I'm not worried, as I'm insured. What would I be worried about, if I were Ben? After our 1970s experience, and a reading of Atkeson and Ohanian, I'm not sure why anyone thinks of inflation forecasting in terms of Phillips curves. As well, even if I were to swallow the Phillips curve - hook, line, and sinker - there are good reasons to think that there may not be any excess capacity out there. Further, in the data I'm looking at, I see plenty of reasons to think that we are in for more inflation, and one of those reasons has to do with the Fed's wishful thinking about the power of reserve-draining tools. 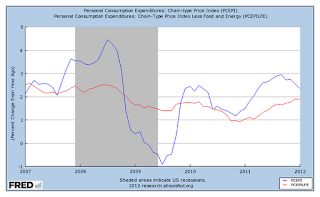 The first chart shows you what our recent inflation experience is. I'm showing you raw pce inflation, and core pce inflation (year-over-year % rates of change). Though raw pce inflation is coming down, it is currently above the Fed's (now explicit) 2% target. Of course, the Fed takes its dual mandate seriously, but for an inflation rate of 2.5% to 3% to be acceptable, we have to think that we are currently well below capacity. That's not clear. In terms of conventional monetary aggregates (not including the monetary base - we know why swaps of reserves for T-bills are currently irrelevant), what we see is in the second chart. This would certainly alarm an Old Monetarist. 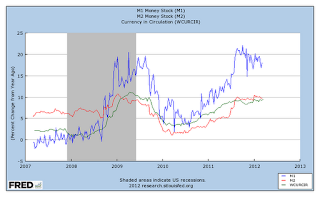 Year-over-year percentage rates of increase in currency, M1, and M2, have been increasing since early 2010. 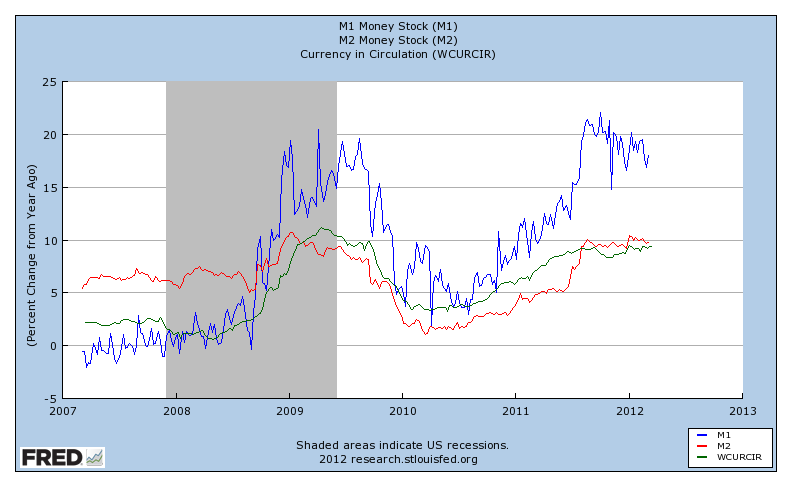 The rate of growth in M2 is close to 20% per annum, and for currency and M1, it is close to 10%. A quantity theorist would not think of those numbers as commensurate with 2% inflation. Of course, we're not Old Monetarists, are we? A New Monetarist thinks that, under current circumstances (a large stock of excess reserves, and the interest rate on reserves - IROR - determining short nominal rates) the inflation rate is determined by the demand for and supply of the whole gamut of intermediated liquid assets - including Treasury debt of all maturities and asset-backed securities. We can't even measure everything we want to in that respect, including shadow-banking activity. For all we know, there may be a lot of substitution going on between observed and unobserved intermediation activities. 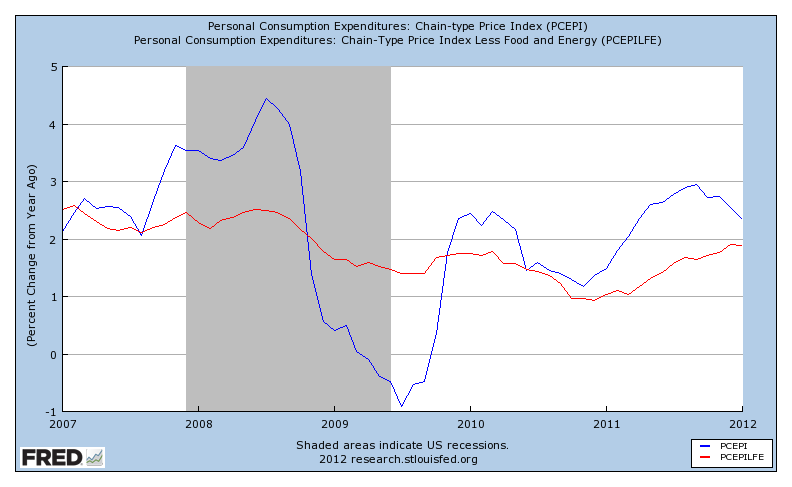 Still, the second chart does not make me optimistic about inflation. What about measures of anticipated inflation? The next chart shows the breakeven rates implicit in 5-year and 10-year Treasury bond yields and TIPS yields. There's nothing much alarming in there, though there has been a modest increase recently in these breakeven rates, which are close to where they were pre-financial crisis. Keep in mind, though, that in early 2007 the fed funds rate was at 5.25%. It's now below 0.25% (with the IROR at 0.25%), so if we really think that we have to adjust downward our notion of current capacity in the US economy, this would tell us that the policy rate should be higher. This reasoning is of course predicated on pre-crisis policy being optimal. That's a leap, but you have to start somewhere. Finally, I think that, in line with this idea, reverse repos and term deposits at the Fed are irrelevant currently. If quantitative easing (QE) is irrelevant at the margin, reverse repos and term deposits cannot make any difference either, at the margin. If the Fed does enough of those things, of course, that will make a difference. But we're talking about $1.6 trillion worth. Bottom line: I think some serious inflation is coming, maybe sooner than later. 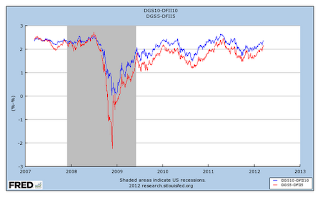 The Fed thinks it can control this with reverse repos and term deposits at the Fed. No way. When will the inflation happen? In line with this post, look out for increases in house prices. The higher house prices will support more credit, both at the consumer level, and in higher-level financial arrangements. The "bubble" will grow, and support the creation of more private liquid assets, which will in turn substitute for publicly-issued liquid assets, causing the price level to rise. The Fed can control the inflation, if they want to, but only if they increase the IROR, which they are loathe to do. Noah Smith provides a convenient summary of a blogospheric conversation on "microfoundations." This illustrates a key principle, which I think we should all take to heart. If one's goal is to learn macroeconomics, one's time would be much better-spent, say, by spending a year participating in Tom Sargent's NYU macro reading group than by spending a year reading the macro blogospherians. Some of the ideas in this post can also be found in this extended piece, if you want more detail. The term "microfoundations" comes from the Phelps volume, Microeconomic foundations of employment and inflation theory (1970), which, along with Lucas's 1972 JET paper, represents the watershed in modern macroeconomics. I have never been too fond of the term "microfoundations," as this gives you the impression that the theory is somehow hidden from view - its in the foundation, and the working parts you are seeing are some kind of reduced form. For me, the theory is not just the foundation, but the walls, the roof, the plumbing, the electrical work, etc. A macroeconomic model is a coherent whole built up from all the useful economic theory we have available. The bits and pieces are the preferences, endowments, technology, and information structure, and we tie those bits and pieces together with optimizing behavior and an equilibrium concept. Optimization is pretty weak. It's just some notion that the people living in the fictional world we have constructed are doing the best they can under the circumstances. The circumstances could be pretty bad, in that these people may not know a lot about what is going on. They may not know things about the people they are supposed to be trading with, and/or they may not be able to observe some aggregate variables, for example. There are many equilibrium concepts - standard competitive equilibrium, Nash equilibrium, pricing using bargaining solutions, competitive search, etc. All that we require from the equilibrium concept is that it coherently yields consistency among the decisions made by individuals. Why do we do it this way? There are two reasons. First, from the point of view of doing pencil-and-paper economics, we are going to learn a lot more. Given the structure of the model, we can evaluate how changes in the technology affect the trading arrangements among economic agents, and we can evaluate how these changes affect economic welfare in a well-defined way. We can also evaluate the effects of government policies sensibly. We have been explicit about preferences in the model, so we can theoretically determine what optimal policies look like. Second, from the point of view of practical policy evaluation - what working economists are doing - or should be doing - in the Federal Reserve System and at the U.S. Treasury, we want models that are structurally invariant to the policies that we have constructed the model to evaluate. That's what the Lucas critique is all about, though earlier writers understood what "structure" meant. That's part of what the early work (and later work too) of the Cowles Foundation was about. See in particular the 1947 quote from Koopmans here. Structural models are useful in other fields of economics as well - not just in macro problems. A lazy econometrician would like the data to do the work for him/her, or to design the perfect experiment that he/she can run to test a particular theory, or to evaluate a particular government policy. But the value of experimental work is debatable, and much experimental work would benefit if more weight were put on the theoretical input. Oftentimes, in any field, and particularly in macroeconomics (where experiments are typically impractical and natural experiments hard to find), researchers and policy evaluators have to invest in serious theoretical and empirical tools in order to make any progress. But how do we differentiate between what is structural and what is not? That's very subtle. We know that any model is an abstraction, and will therefore be wrong - literally. But the art of building a good model is to make it less wrong on the dimensions we are going to use it for than on the dimensions we will not use it for. Here, we need examples to show how, if we use the structural model, we are going to do "pretty well" in terms of policy evaluation, but taking the astructural approach will give us really stupid policy. The standard example, which Lucas used in his critique paper, is the Phillips curve. Following the astructural approach, I stare at the data, and observe that the unemployment rate and the inflation rate are negatively correlated. I infer that there is a tradeoff between inflation and unemployment - I can get less unemployment if the central bank acts in a way that increases the inflation rate. Central banks in the 1970s actually acted on that advice, in spite of what Milton Friedman had said in 1968, and Lucas had written down in his 1972 structural model. Friedman and Lucas advised that no long-run Phillips curve tradeoff existed, and that exploiting any short-run Phillips curve tradeoff would be the wrong thing to do. Policymakers did not listen, and then had to spend the early 1980s correcting the inflation problem they created in the 1970s. The Phillips curve example makes Friedman and Lucas look good, but another example makes that pair look bad. Central to Old Monetarism - the Quantity Theory of Money - is the idea that we can define some subset of assets to be "money". Money, according to an Old Monetarist, is the stuff that is used as a medium of exchange, and could include public liabilities (currency and bank reserves) as well as private ones (transactions deposits at financial institutions). Further, Friedman in particular argued that one could find a stable, and simple, demand function for this "money," and estimate its parameters. Lucas does that exercise here, and then uses the estimated money demand function parameters to measure the costs of inflation. What's wrong with that? The key problem, of course, is that the money demand function is not a structural object. Some central bankers, including Charles Goodhart, figured that out. Goodhart's idea is a bit subtle, but there are more straighforward reasons to think that the parameters we estimate as "money demand" parameters are not structural. First, all assets are to some extent useful in exchange, or as collateral. "Moneyness" is a matter of degree, and it is silly to draw a line between some assets that we call money and others which are not-money. Second, the technology determines how different assets are used in exchange. Financial innovations made asset backed securities very useful as collateral, and in financial market exchange. Those innovations changed the relationships among what we measure as monetary aggregates, inflation, asset prices, and aggregate activity. Third, regulations matter for how assets are used in exchange. Paying interest on reserves matters; paying interest on transactions deposits at banks matters; reserve requirements matter; deposit insurance matters; moral hazard problems and how they are regulated matter. But how structural do we want to get? More structure in our models means more detail, but more detail increases technical complexity, and we want our models to be simple. The model can't be a literal description of the world, as then it would fail to be a model, which simplifies the world so we can understand it. Nevertheless, economists sometimes pay lip service to structure while writing down models that have astructural features. If you have read Woodford's Interest and Prices, you know that he cares about structure. There are plenty of references in Woodford's book to Lucas's critique paper. But some of Woodford's work looks very astructural. Some New Keynesian analysis is done in linearized models with quadratic loss functions that capture the "preferences" of policymakers. That all looks very astructural 1975, in spite of the excuses that are typically given for taking that type of approach. Astructural stuff is all around us - habit persistence, adjustment costs, cash-in-advance constraints, money-in-the-utility-function. Sometimes those things can be convenient short-cuts, but they have to make you suspicious. In some cases, they help you fit the data - as Larry Christiano well knows - but are not well-rooted in structure. One thing we know from long ago is that the structural approach is completely unneceessary if all we want to do is forecast the future paths of macroeconomic variables. At the Minneapolis Fed in the late 1970s and early 1980s, Neil Wallace and Tom Sargent understood the Lucas critique and why structure was important for evaluating alternative economic policies. But no one objected to what Robert Litterman was doing, which was conducting forecasts using an astructural Bayesian Vector Autoregression. Indeed, one could argue that the behemoth Keynesian macroeconometric models developed at the Fed, MIT, and Penn in the 1960s and 1970s, and their modern counterparts are perfectly acceptable forecasting tools, though no one in their right mind would use those models to evaluate policy.